DO ALL HOMES HAVE A RADON PROBLEM? The quickest way to test is the short-term test. The typical short term test for real estate transactions consists of a 48 hr. to 96 hr. test. At ClearView Home Inspection our radon tests are conducted using a device known as a “continuous radon monitor”. This monitor, placed in the lowest habitable level of the home for a minimum of 48 hrs., provides a comprehensive picture of the radon activity in the home during the test period. With this test method test results are provided immediately at the end of the test period. There’s no need to wait days for a lab to receive and process results from a charcoal canister test (the test method used by many home inspectors). Often, I can place the continuous radon monitor in the home several days prior to your home inspection, and read and provide the test results at the time of your home inspection. CAN RADON LEVELS IN THE HOME BE REDUCED? Absolutely. Don't pass on a great house because it has elevated radon. Radon reduction systems are effective and they are not too costly to have installed. The amount of radon in the air is measured in "Pico curies per liter of air," or "pCi/L. If, following a short term radon test the average radon level in the home is found to be 4 pCi/L or higher, you might consider further action to lower the level. The cost of reducing radon in your home depends on how your home was built and the extent of the radon problem. Most homes can be fixed for about the same cost as other common home repairs. 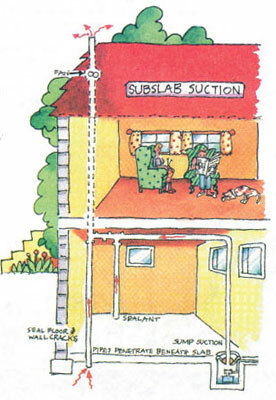 The typical radon reduction system, known as a soil suction radon reduction system, does not require major changes to your home. Some radon reduction systems can reduce radon levels in your home by up to 99%. Even very high levels can usually be reduced to acceptable levels. RADON is the number 1 cause of lung cancer among non-smokers, according to EPA estimates. Overall, radon is the 2nd leading cause of lung cancer. Radon gas in the home is a health hazard that is easy and inexpensive to detect and fix. If you have any questions about radon in air or water give me a call. A radon test, as a stand alone test or a test performed in conjunction with a home inspection can be scheduled. Copyright 2010 ClearView Home Inspection. All rights reserved.Web Hosting by Yahoo!